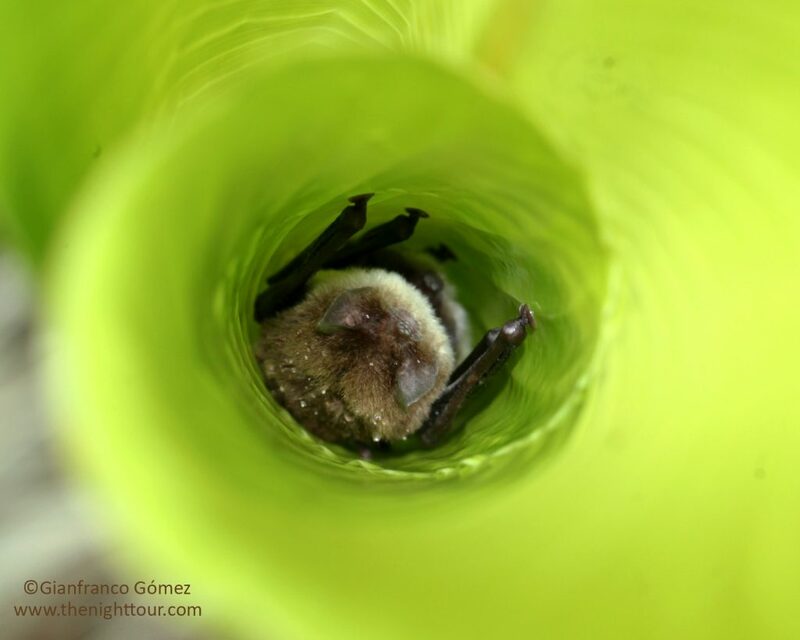 Have you ever wondered how a bat can poop and pee, while upside down, and not end up a filthy mess? I must admit the thought had never occurred to me. I guess I just assumed that sometime during their evolution that issue would have sorted itself out. It is thought that bats began roosting upside down early in their evolution because dropping head first from their roosts makes it easier for them to take flight. By hanging from their feet bats are able to spread their wings before letting go of their roost and are poised for flight as soon as they hit the air. Notable exceptions to this rule are Disk-winged Bats, which roost right side up. These tiny insectivores roost in groups inside rolled Heliconia and Banana leaves. Suction cups on their thumbs and heels enable them to stick to the sides of the leaves. But I diverge…back to the pooping and peeing. About a week ago we came across a Tent-making Bat, Artibeus watsoni, and as we watched the little bat began to pee….and it was amazing! It didn’t get a single drop on itself! 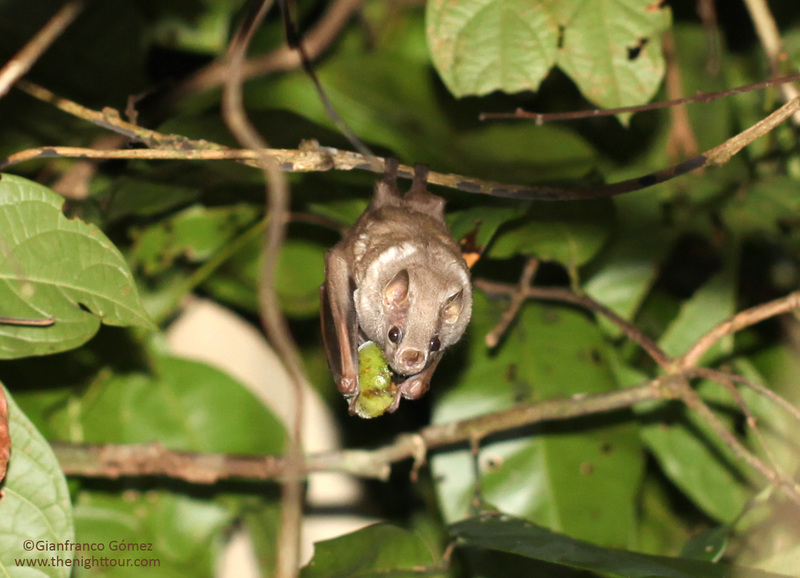 A few days later, while on the tour, I spotted a bat feeding in a tree about 7 meters off the ground. I knew right away it was not one of the typical fruit bats we tend to see. It was quite small and had very light colored fur. I got it on the scope and we watched it as it fed. It turns out that this cute little bat, Chiroderma villosum, is not a common one to see at all. During all the years of doing the Night Tour we have only seen it a couple of times. Their common name, the Hairy Big-eyed Bat, is quite fitting. They have really big eyes for a bat and long shaggy fur. They are quite distinctive from other fruit bats as they have light colored fur and very faint, barely visible facial and middorsal stripes. Next to nothing is known about these little bats. Their roosting sites are unknown and they are only known to feed on 3 species of fruit. They are rarely captured in mist nets and it is thought that they dwell mainly in the canopy. We feel fortunate to have observed this little guy and to have gotten a glimpse into its otherwise secretive life; including its feeding and toilet habits. This entry was posted in Uncategorized by Gianfranco & Tracie. Bookmark the permalink.